One of the saddest statistics about my life is the amount of time that I spend pointlessly debating anti-scientists. Having devoted so much time to this endeavor has, however, allowed me to observe certain patterns and trends in their debate tactics. Specifically, there are several flawed debate strategies that anti-scientists frequently employ. In fact, I have rarely been in a debate where my opponent did not at some point commit one of these. So in this post, I am going to describe seven fundamentally flawed, yet extremely common debate tactics that you should watch out for and avoid at all cost. If you commit one of these, then you have automatically lost the debate. When I say that you lost, I am obviously being somewhat facetious because the fact that you used a bad argument doesn’t inherently mean that your position itself is flawed (that would be a fallacy fallacy). Nevertheless, these strategies generally arise as a result of a fundamental weakness in the position that is being defended. As such, their use does generally indicate a critical problem that must be taken seriously. Finally, even if the position you are arguing for is actually correct, these strategies are so flawed that I would still contend that using them automatically costs you the debate itself (it is technically possible to lose a debate, but still be right). The problems with this response are numerous. First, it’s nothing more than an ad hominem fallacy. It attacks your opponent rather than attacking his/her position. Second, it’s an ad hoc fallacy and places the burden of proof on you. 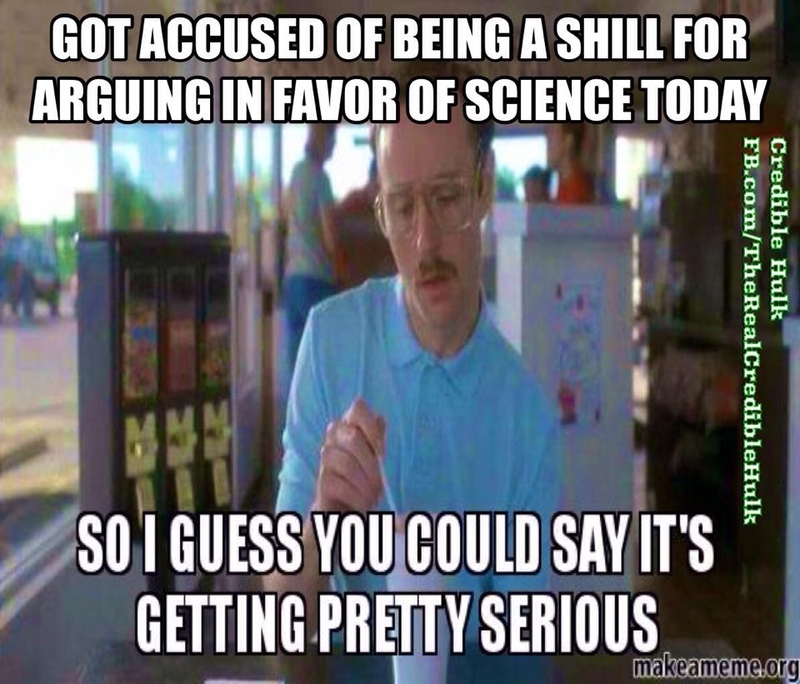 In other words, you cannot accuse someone of being a shill unless you have actual evidence that they are in fact being paid off. The fact that someone would dare to disagree with you does not automatically mean that they have a financial motive for doing so. Finally, it is often a red herring fallacy because it conveniently dodges any contrary evidence that has been present against your position (more on that later). This tactic fails for the same basic reasons that the shill gambit fails, but its structure is somewhat different so I want to talk about it separately. In this case, you don’t accuse the actual person that you dealing with of being paid off. Rather, you blindly reject all of their sources by accusing the authors of being shills. For example, I frequently present anti-vaccers with papers that discredit their arguments, and when I ask them why they refuse to accept those papers, they almost invariably respond that, “the study was funded by Big Pharma” or “those authors were paid off” or “they are just in it for the money.” As with the normal shill gambit, this is nothing more than an ad hominem assault. It confidently ignores the results of the paper by attacking its authors. Also, scientific papers always included funding sources and author affiliations. So you can check and see whether or not the authors had a financial conflict of interest. When I point this out to anti-vaccers, they usually claim that the money is being distributed under the table and isn’t officially reported, but at that point, we are back to logically invalid ad hoc reasoning, and, once again, the burden of proof is on them. This is closely related to the first two flawed tactics, but it has a much wider scope. So wide, in fact, that it utterly astounds me that anyone would ever use it. For this flawed strategy, you don’t simply accuse your immediate opponent of being a shill, nor do you accuse a handful of scientists of being corrupt. No, for this logical blunder, you accuse the entire scientific (and/or medical) community of being involved in some insanely large conspiracy. The exact nature of the supposed conspiracy varies widely, but the core reason for proposing it is always the same: when faced with the fact that nearly all experts disagree with them, people try to discredit all of those experts in one fell swoop by accusing all of them of being in a massive conspiracy. This approach suffers all of the problems of the shill gambits, but those problems are magnified a thousand times. Now, the burden of proof doesn’t simply require you to prove that one or two people or corrupt; it requires you to prove that hundreds of thousands of people are corrupt! If you have to invent an extensive global conspiracy of astronomical proportions to defend your position, then your position is so fundamentally weak that it is beyond saving. 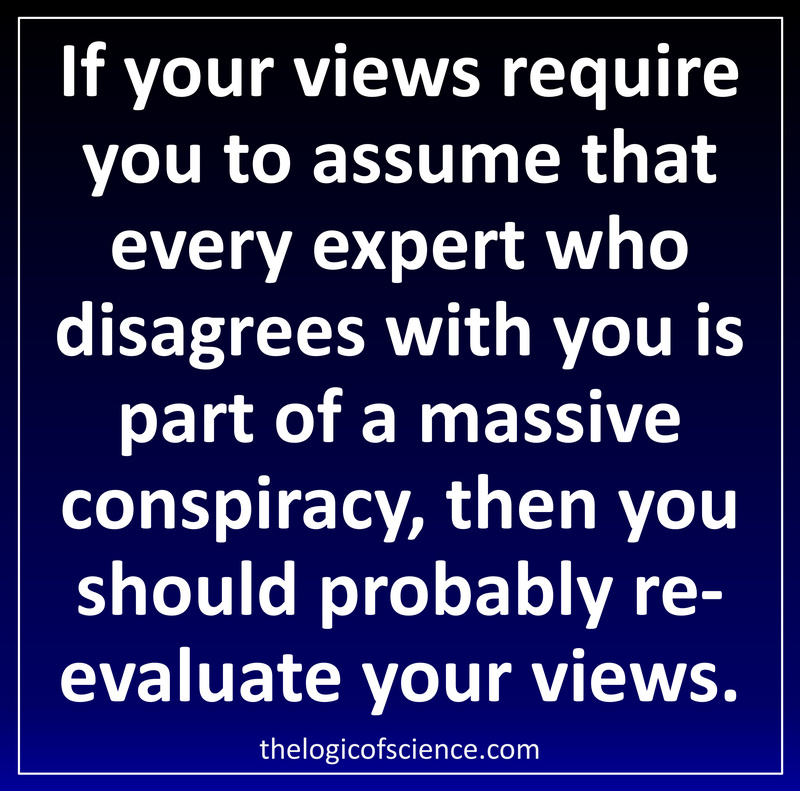 This problem arises from inconsistencies in your arguments and views. Basically what happens is that when you are faced with contrary evidence, you simply make an ad hoc modification to your view rather than rejecting it. This most clearly occurs when you have stated a clear challenge or dogmatic thesis. For example, many anti-vaccers are adamant that thimerosal in vaccines is causing autism. One of the key problems with this claim is the fact that thimerosal hasn’t been in childhood vaccines for over a decade, yet autism rates haven’t dropped. When presented with this fact, anti-vaccers generally change their thesis and begin to adamantly proclaim that it is the aluminum in vaccines that is causing autism. At its core, the problem here is that this line of reasoning is ad hoc. Anti-vaccers have decided beforehand that vaccines cause autism, so when shown evidence to the contrary, they simply modify their explanation of how vaccines are causing autism. The difficulty with this is that nothing will ever convince them that vaccines don’t cause autism. No matter what data they are presented, they will keep shifting their goal posts so that the conclusion is always that vaccines cause autism (this often involves question begging fallacies). Global warming deniers not only commit this blunder, but they generally do so in a predictable pattern. When I make the mistake of engaging them, they generally start with the position that the planet isn’t even warming. With no small amount of effort, I can usually at least convince them that the planet is in fact warming, at which point, they simply change tune and claim that it’s just a natural warming and it’s not our fault. Using satellite data (Harries et al. 2001; Griggs and Harries 2004; Chen et al. 2007) and isotope ratios (Bohm et al. 2002; Ghosh and Brand 2003;Wei et al. 2009), I can sometimes persuade them that we are actually the cause, but if I am successful in that endeavor, they inevitably retort that it won’t actually be that bad, so we don’t need to do anything about it. Sadly, when shown evidence to the contrary, they usually either resort to shifting back to one of their previous positions or they just go full conspiracy theorist. The problem is, again, that they have already decided what is correct, so nothing will ever make them reject their view. Rather, they will simply continue to twist, contort, and modify it indefinitely. The red herring fallacy occurs when you simply ignore one of your opponent’s arguments. This can be very obvious, such as playing the shill card and constructing a conspiracy theory, but it is often more subtle. People often commit this fallacy by responding in a way that gives the illusion that they answered the criticism when in fact they addressed a totally separate issue (politicians are masters at this, watch for it in the next political debate). I want to focus on the more blunt version of this because it is the one that I see most frequently in internet debates. One of my favorite debate tactics is either to present a logical proof for my position or ask a question that reveals a fundamental inconsistency in my opponent’s reasoning. For example, I might present a logical proof for anthropogenic climate change, or I might ask young earth creationists why they use science to interpret Joshua but not Genesis. Both of these illuminate fundamental problems with my opponents’ positions that must be addressed in order for those positions to be valid. When faced with these problems, my opponents nearly always play red herring. They simply ignore my challenge and move on to some other point. This is not a logically valid strategy. You must deal with serious criticisms of your position, and you cannot simply ignore any arguments that discredit your view. I generally refuse to let people get away with this and continually come back to my challenge until they finally deal with it (or usually just commit one of the other blunders that I have already discussed). #6. Citing Natural News, Mercola, Whale.to, etc. 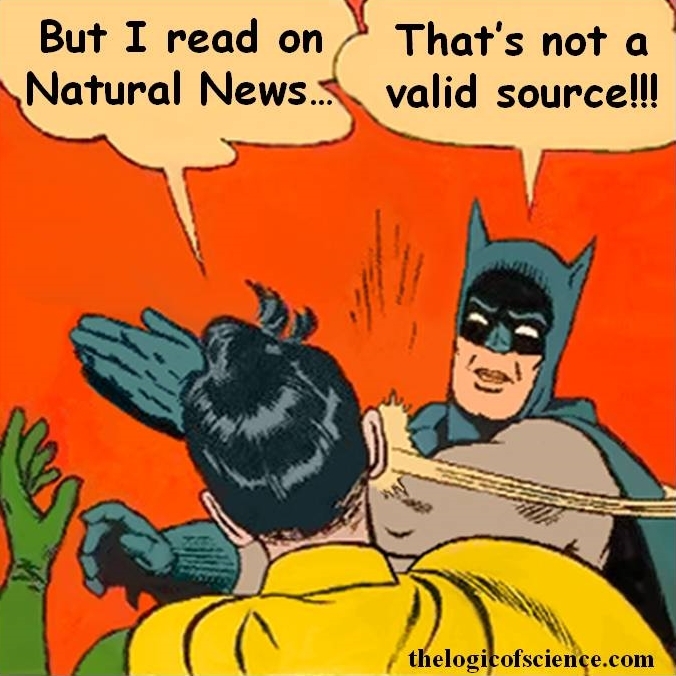 The internet is full of terrible, misleading, and downright dishonest sources, and if your argument is based on those sources, then you have a very serious problem. Similarly, when faced with information that opposes your position, you cannot cite these illegitimate sources. You must defend your position using valid sources, and in science, that means using the peer-reviewed literature. If you cannot find support for your position there, then support for your position doesn’t currently exist. This should be an obvious problem, but for some reason I frequently encounter people who proclaim this with pride as if the strength of their resolve correlates with the strength of their position. I wrote about this problem in detail here, but to briefly summarize, you must always be willing to challenge your views. If you start off by ardently proclaiming that you are correct, then you will always find a way to twist the facts so that they seem to fit your preconceived views. The fundamental problem is that at this point it is impossible to disprove your position no matter how clearly flawed it is. In other words, even if your position is the stupidest thing that anyone has ever come up, nothing will ever convince you of that because you have already decided that you are right and, therefore, you won’t even look at the evidence to the contrary. This is an extremely serious problem, and it is a cognitive trap that you should avoid at all cost. Never hold any position so dear that you are not willing to admit the possibility that you might be wrong. This entry was posted in Global Warming, Rules of Logic, Science of Evolution, Vaccines/Alternative Medicine and tagged anti vaccine arguments, Bad arguments, burden of proof, creationism, evaluating evidence, evolution, global climate change, logical fallacies, rules of logic, Vaccines. Bookmark the permalink.